Life Member (India) : Rs. 2500/- + Entrance Fee Rs.300/- with effect from 1st April, 2016. Life Member (Overseas) : US $. 200/- only. No Entry Fee. - with effect from 1st April, 2016. Ordinary Members : Rs. 500/- annual and Entrance Fee Rs.200/- with effect from 1st April, 2016. Ordinary Members name will be removed form membership without notice if not paid for 3 years. No Overseas Ordinary Members to be taken. Any person above the age of 18 years interested in the art & science of Philately is eligible to join the Society on application and on payment of requisite fees. 2. Any Philatelist who is resident in India shall be eligible to be a Life Member of the Society on payment of Membership fee (mentioned above) with the membership application + entrance fees (mentioned above). 3. Any Philatelist who is resident abroad is eligible to be a Life Member of the Society on payment of Membership fee (mentioned above). 4. Children below 12 years of age are not eligible to be Members. A Person below the age of 18 years will not be eligible to be a Life Member of the Society. 5. In case of the applicant being minor between the age of 12 to 18 the application should also be signed by the parent / guardian. Such member shall have all the rights except voting rights till he / she attains the age of 18. 6. The Membership year of the Society shall be from 1st April to 31st March of the subsequent year. (a) A Member who is in arrears of fees shall loose all his membership privileges till he / she clears the arrears with a reasonable fees. (b) The rights and privileges of a member shall be personal & not transferable. 7. A member will receive a free copy of the Philatelic Journal of India, the house magazine of the Society (Subject to the publication of the said journal) and is entitled to a free classified advertisement of 25 words, once in a year. 8. A member can attend Fortnightly Meeting of the Society currently held in the G.P.O. Mumbai on the 1st, 3rd and 5th Saturdays each month except on Bank Holidays. Any change in the venue can be ascertained from the Hon. Secretary / Editor. 9. The member can use the Soiety's Library according to rules framed for the pupose from time to time. 10. 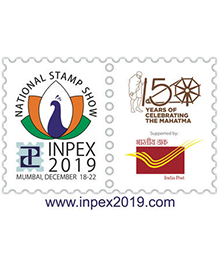 The members can participate in an Exhibtion organised by the Society as well as those held under the patronage of the Philatelic Congress of India, the F.I.P. and F.I.A.P. 11. Members can buy Soiety's new publication as and when published at such concessional price and terms and conditions as may be fixed by the Governing Council.